The number of new cases of Ebola has risen in some of West Africa's worst-hit countries for the second week in a row, the World Health Organization (WHO) says. This is the second weekly increase in confirmed cases in 2015, ending a series of encouraging declines. The WHO said on Wednesday that Sierra Leone had registered 76 of the 144 new cases, Guinea 65 and Liberia three. More than 9,000 people have died from Ebola since December 2013. The WHO said that the increase - there were 124 new cases the previous week - highlights the "considerable challenges" that must still be overcome to end the outbreak. "Despite improvements in case finding and management, burial practices, and community engagement, the decline in case incidence has stalled," the UN health agency said in a statement. In another development, US President Barack Obama has said he will withdraw nearly all US troops helping to combat the disease in Liberia. Image caption Mr Obama said that the outbreak had been a "wake-up call"
Mr Obama said on Wednesday that the withdrawal marked a transition in the fight against the disease in Liberia but did not mean that the mission was over. "Our focus now is getting to zero," he said. At least 22,800 cases of Ebola have been recorded since the outbreak began, mainly in three countries in West Africa. 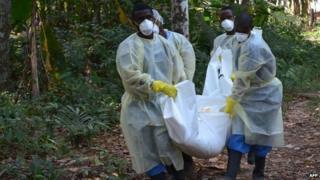 In Guinea, efforts to end the outbreak are being hampered by a mistrust of aid workers, particularly in the capital city. "The main threat to achieving our goal of zero cases in 60 days is this resistance in Conakry," said Dr Sakoba Keita, Guinea's national Ebola response co-ordinator. Unsafe burial practices continue to be a problem in Sierra Leone. More than 40 unsafe burials were recorded in one week, according to the WHO. Mourners can catch the disease by touching the highly-contagious bodies of the dead.